A great value pack of the most popular size tempered glass containers for baby food. Would make a great new baby gift for the parents who care about safe, home made, BPA free food for their baby. Two Cubes, Two Tubs, Two Snack size. Tempered Glass is simply glass that has been strengthened during the manufacturing stage. There are several advantages to using tempered glass and it should be the only glass used in situations that require a lot of temperature changes (such as freezing and heating). 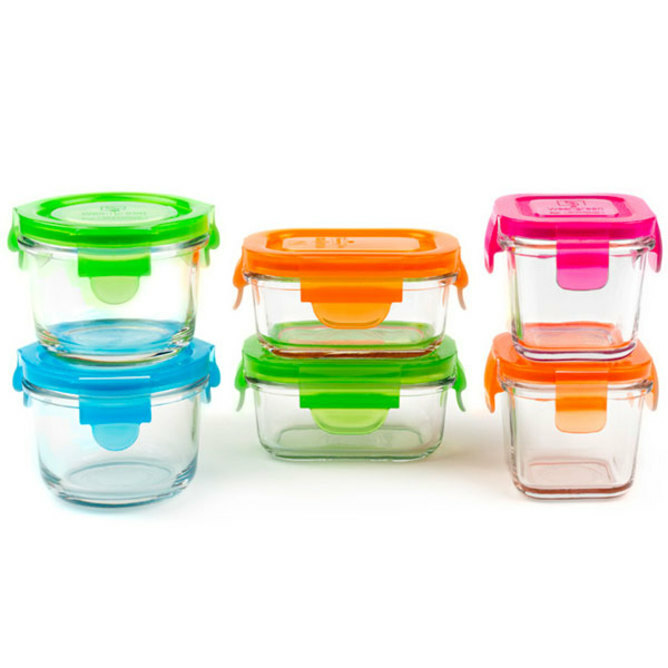 Tempered glass baby food containers are four to five times stronger than regular glass. When you accidentally drop tempered glass on your hard wood floor the chances of it breaking are extremely less than that of regular glass! Non tempered glass is not designed to withstand sudden and drastic temperature changes. When non-tempered glass is frozen it has a large probability of breaking off into microscopic shards and entering your food. When you heat non-tempered glass there are micro air bubbles and as they get hotter they will expand to the point where they blow up (trust me!). Because tempered glass has been treated to withstand heating there are no micro air bubbles that are allow it to blow up. With ALL glass, tempered or not, it is still susceptible to thermal cooling shock. One example of thermal cooling shock is when a hot container is thrown in a bowl of cold water, it will break! Tempered Glass also lasts longer. Continued use will not wear it down to a point where it becomes more fragile. It can go from the freezer to the microwave to the dishwasher six times a day and still obtain its strength. When non-tempered glass is used in such applications it is even more susceptible to breakage. While tempered glass is superior to regular glass for food storage it is also superior to all other food packaging materials such as plastic, stainless steel, Styrofoam, and cardboard due to its recycling qualities as well as chemical compositions. Over the short course of business we have had many people ask us why we didn’t simply buy commercial baby food in glass jars and then reuse those jars. It is extremely important to note that commercial baby food jars are not tempered and therefore are not microwave or freezer safe!